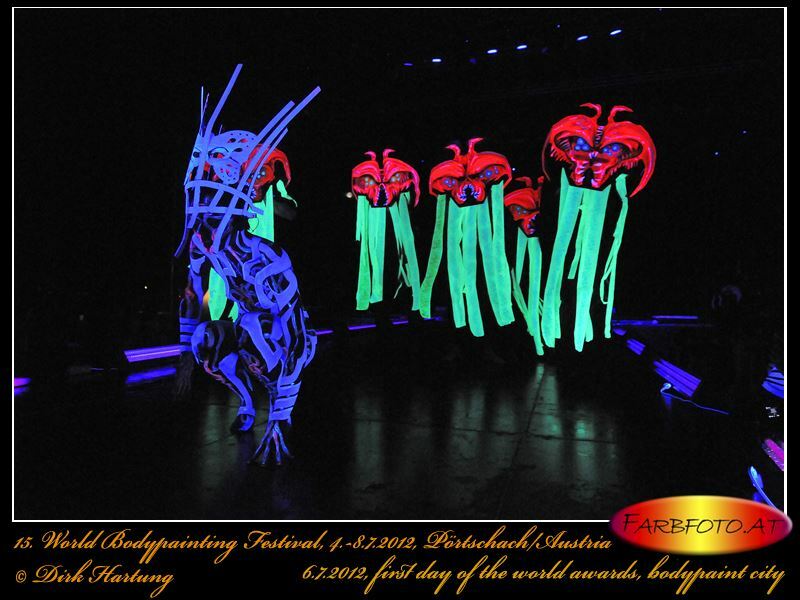 Gugenheim made world's 1st Bodypainter turned keynote speaker at Atheist conference. 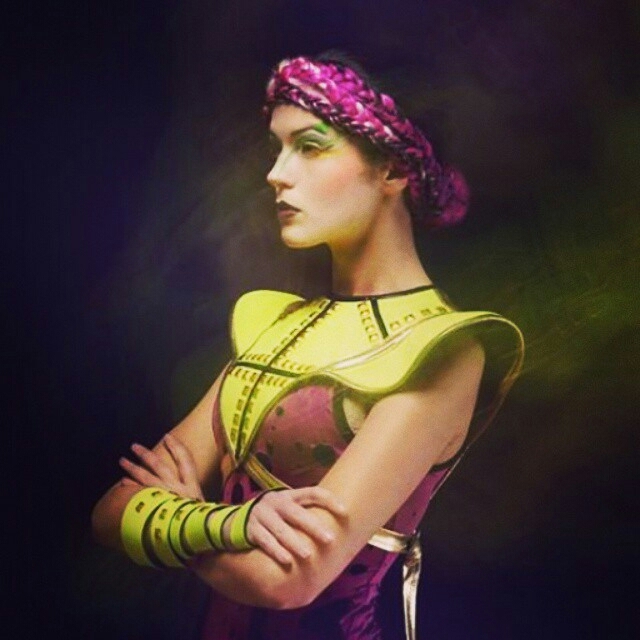 Victoria Gugenheim's signature works of makeup and bodyart that embody science, sci fi, fantasy, fashion and freethought, from private fine art commissions to paints for events, campaigns and brands. 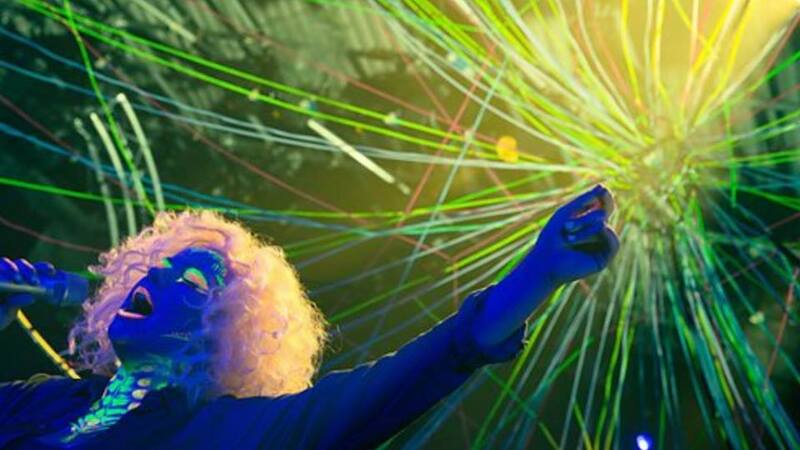 Neon lights and fluoro colours are Victoria's natural domain. Here, bodies become a mixture of science and fantasy, working alongside 3D UV technology to create otherworldy spectacles; perfect for any time you need to make a statement. 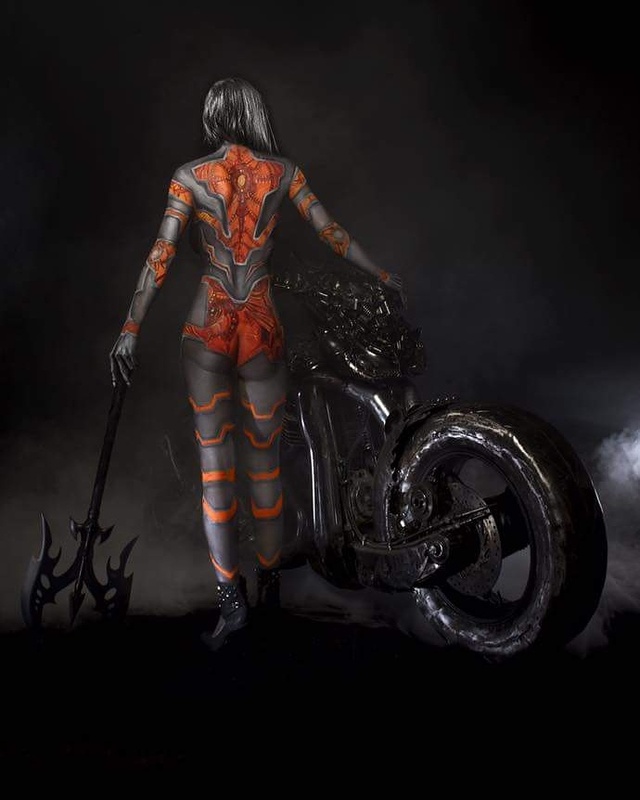 Her 3D work has been seen in Channel 4's The Superhuman Body Handbook, The London Olympics, Cyberdog, and the World Bodypainting Festival; coming 3rd place as part of a team with Wolf's Bodymagic. Collaboration is an integral part of Victoria's process, believing that it's these partnerships and bonds that create truly incredible work. As an intensely driven artist, Victoria Gugenheim's work is constantly evolving. Exhibitions provide a prime opportunity for the evolution of her work to be showcased, with each one crafted to be markedly different to the last as she pushes her artistic endurance and skill ever further. More information is released as the exhibitions draw nearer. Sign up to her mailing list below to stay up to date with ticket releases, locations and much more. Exploring the nature and fluidity of water and what it means to humanity, this one off exhibition with the Refugee Circus Collective sees Gugenheim create not just hybrid works of digital and body art, but explores brand new multimedia iterations of her craft. Join the mailing list below to receive updates and information on where to buy tickets. Working alongside award winning shakespearian actress emily carding, victoria creates a living work of art exploring destruction, creation and artificial Generalised intelligence in relation to the human condition as part of the london science museum's exhibition on the reinterpretation of frankenstein. Exploring our relationship with awe and wonder in a scientific context, Gugenheim uses a veritable forest of information to create beautiful works that educate, inform and inspire. Signings will be held for a limited time. Congratulations on subscribing. You'll now also receive exclusive private view invitations to Victoria's exhibitions. Victoria Gugenheim has been awarded the status of resident artist for CEMB, The One Law for All Campaign, and The International Secular Humanist Conference. In line with Victoria's activism and fighting for human rights and freedoms, Her work now extends to public art and protests, going beyond bodypaint as a tool of exploration and mere beautification. Now, it is a tool of liberation. 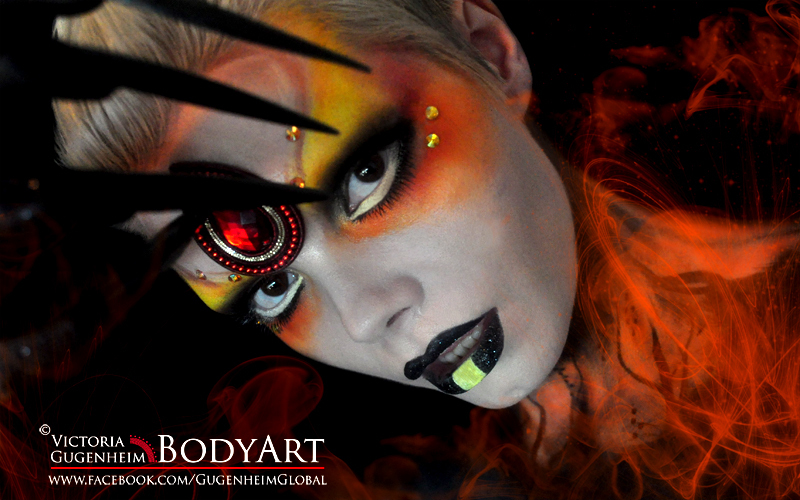 Victoria Gugenheim has been awarded Resident Artist and Judge at The Gibaltar Bodypainting Festival. After a resounding success in their 2017 festival funded by the Gibraltar Cultural Association, Victoria is proud to be on their team, creating public demonstrations, masterclasses, workshops, public art, judging and much, much more. So Who is Victoria Gugenheim, Exactly? Drawing before she could talk, starting makeup at age 6, progressing to face and bodypainting at 9, Victoria Gugenheim has always had an intense drive to create. Deeply studious and compulsively curious, it is this intense need to understand the world around us that fuels her desire to create beautiful works that provoke a reaction, and make people think. Her drive is to understand why we do what we do, and how we can become more than we are. Through her questioning of the world and her research into art and our origins, she has become passionate about the necessity of, and merges, art with science. She believes art and science share a common ancestor with the human imagination, and without imagination there can be no hypothesising. Art is the first visual, material, tangible “What if?” that humanity had, and it started 300,000 years ago deep in the caves near the twin Zambini Rivers of Zimbabwe. 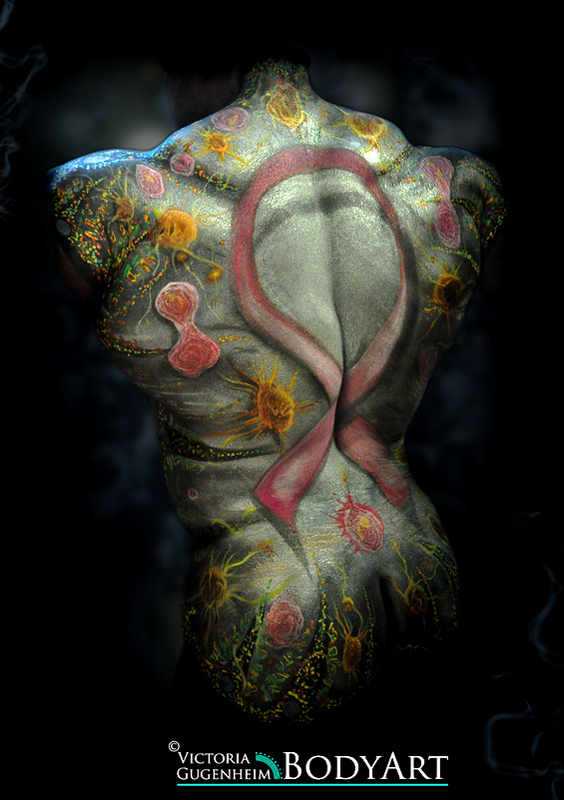 There, Homo Heildelbergenesis created the first known art; art on the human body. 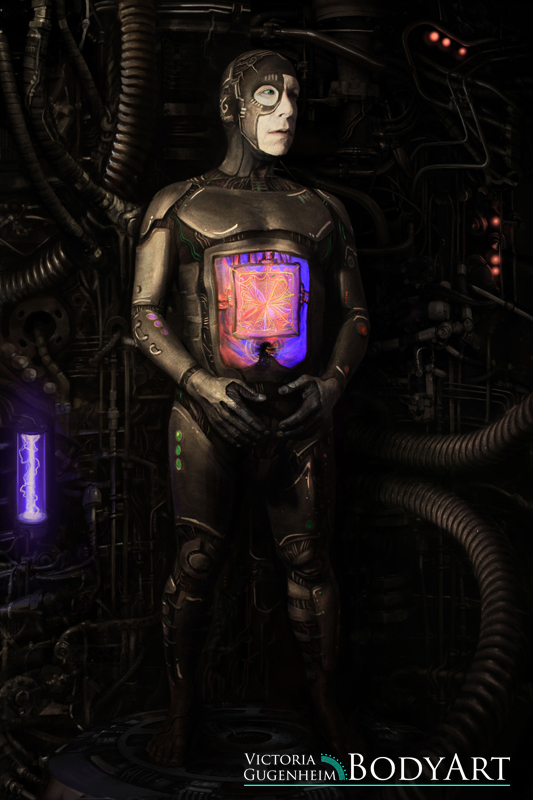 This was used for rituals, accessing altered states of consciousness, tribal hierarchies, and more besides. The key was its immediate, visceral effect that had the capacity to transform our ancestors into greater versions of themselves. After learning of this, she was hooked on bodypainting and makeup for good. 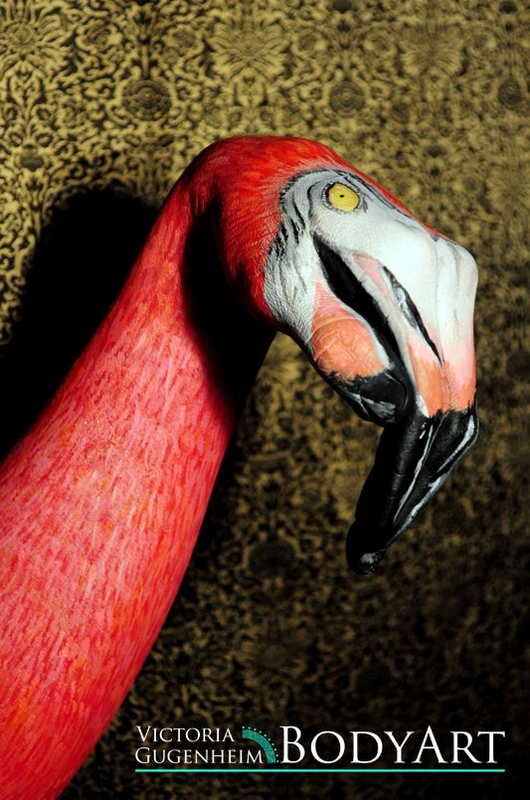 Victoria’s art, both mainstream and alternative, has been part of a lifelong quest of both adorning and “de-othering” people through art, public speaking and personal aesthetic choice, and understands that when someone others another human being, it dehumanizes them, objectifies them and makes them a target for everything, from stereotyping at best to at worst, victims of violence, poverty and death; This is most oftentimes caused by fear born of ignorance. Through connecting art, science, visual representations of the self, human rights activism and questioning what we can become both aesthetically and intellectually, Victoria has carved a niche that no other artist to date has dared step into. Fully committed to living her art, Victoria is not afraid of standing out in the crowd, and encourages others to raise their voices and be heard in a world which cherishes the average over the individual. She believes that only with the realisation of yourself and a willingness to connect with others without othering them, can humanity progress. 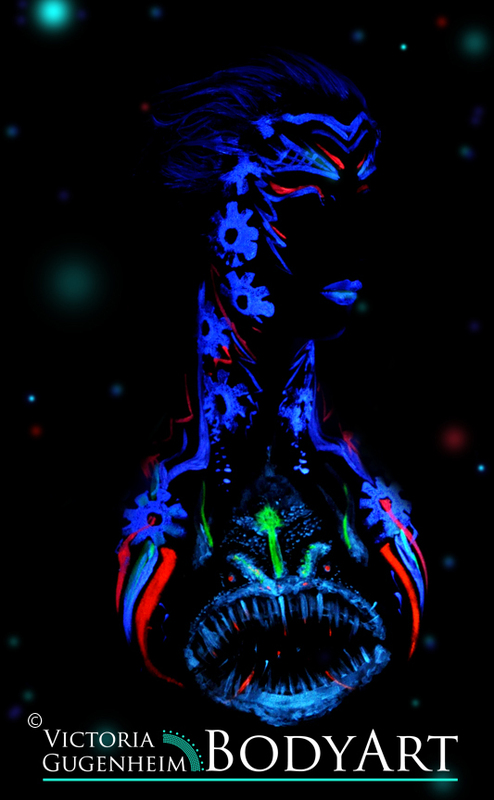 Her art ranges from bodypainting, makeup, photography, performances, installations, digital art, clothing design, drawing and painting, merging with science and technology. Never wanting to be limited, she sought out any media necessary to make a concept work- and it is this industriousness that has helped bring her her current success. 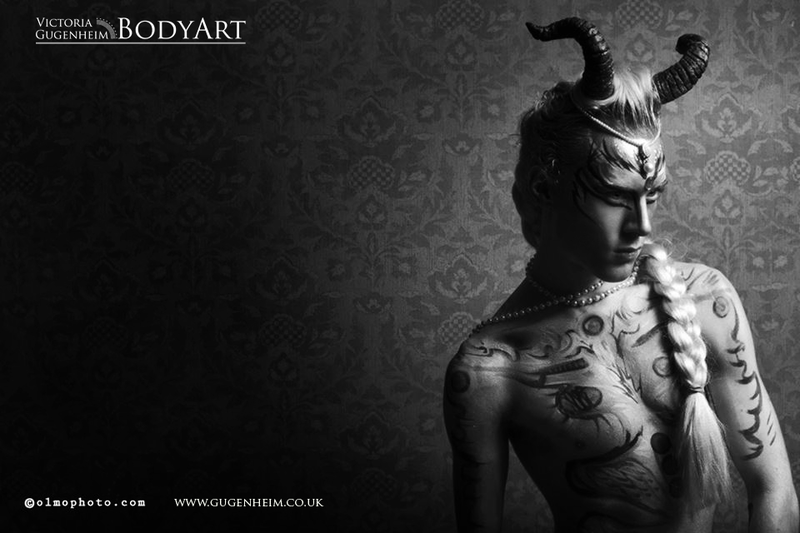 Her clients have included Cirque le Soir, Nokia, London Fashion Week, Models of Diversity, Charlotte Church, Alice Cooper’s Halloween Night of Fear, Girls Roc and The World Bodypainting Festival among many others, as well as private commissions that are undertaken with great care, attention to detail and patience. 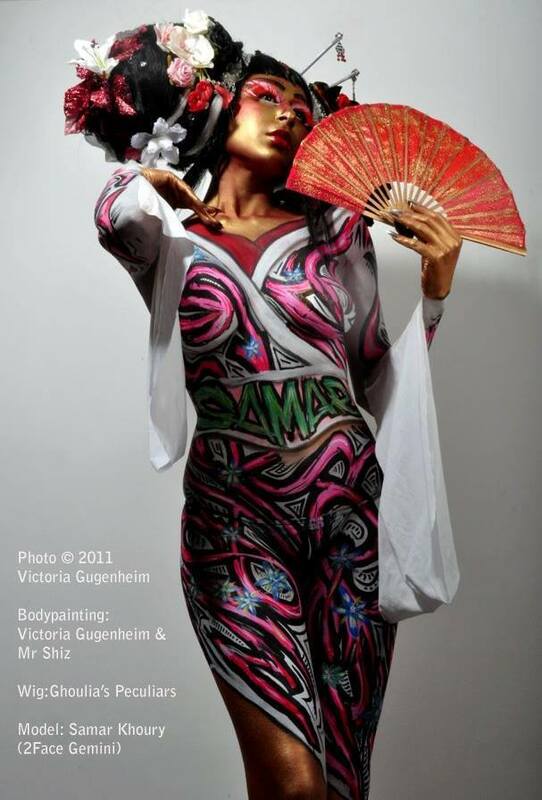 She uses bodypainting as a way of empowering the human spirit, giving the person painted a new found confidence that can be life altering. Questions relating to her work and interview requests can be sent to her via Experience Gugenheim. Victoria Gugenheim has a long list of credits, and below is far from comprehensive. SHOOT: Crossfaith: We Are The Future, Featuring Olivia Harriet Smith. Featured on DVD and Live stageshow. Being painted by Victoria is an experience that she takes great care and finesse over, with mutual compatibility being a key component. As a result, not all personal proposals or inquiries to book are accepted. To reply to a casting on instagram, facebook or twitter, use the contact form below. You can also subscribe to the mailing list for urgent castings and call outs. For further enquiries regarding private shoots, bodyart, makeup, public appearances, interviews or more, use this contact form to get in touch, and let the adventure begin.